With winter finally deciding to come out of hiding, I cant help but to take some responsibility for the sudden drop in temperature. I may have insulted our dearest mother nature with my exciting response to the spring weather we have experienced here in New York City during the month of December . 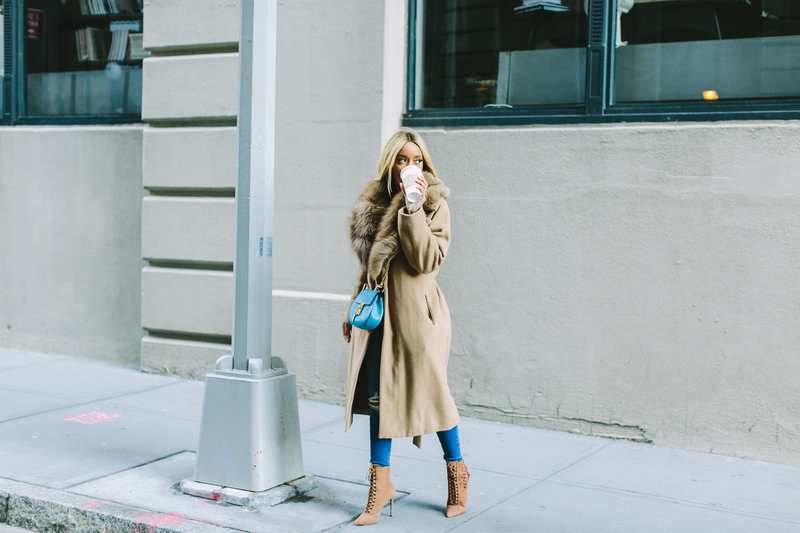 Today I was completely prepared to take on the chilly NY weather in my fur collared Lafayette 148 camel coat. 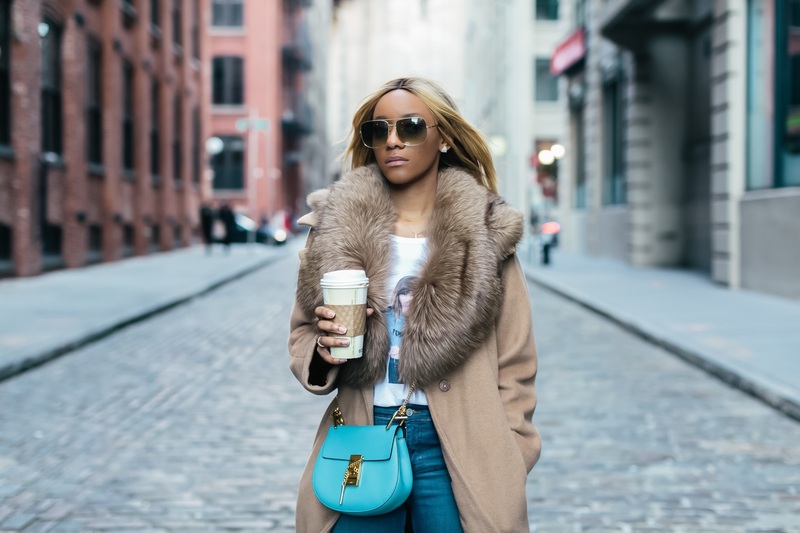 If you haven’t already noticed this fur collar may look a bit familiar, it is because it’s the same detachable collar worn in my Balmain Prep look. Perfect for the 34 degree weather we are experiencing today. As I take my stroll in the DUMBO section of Brooklyn, a stop for a peppermint tea warm up is needed . Channeling my inner cowgirl, today I wore my Alexandre Birman Katy tassel boots. I love the western realness given with the pointed toe, knot-woven side panel, and tassel-fringe trimmed side. 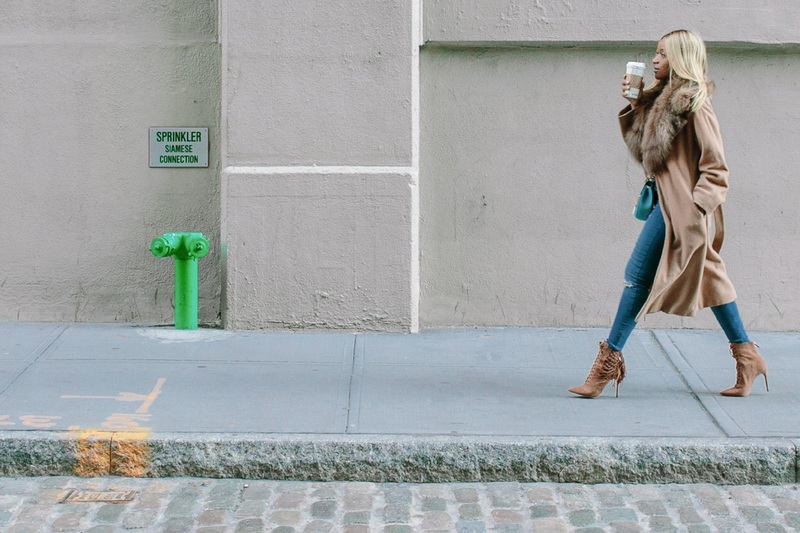 With these Alexandre Birman boots complimenting my camel coat, I am ready to take on the wild wild west in the winter. I am completely in love with comfortable denim. My TOPSHOP ripped Jamie jean are one of my favorites. Super stretchy high-waisted skinny ankle grazer perfect to pair with my Alexa Chung for AG t-shirt. Offsetting the neutrals adding a pop of color with my Saint Laurent arty ring, and my Chloe drew purse. 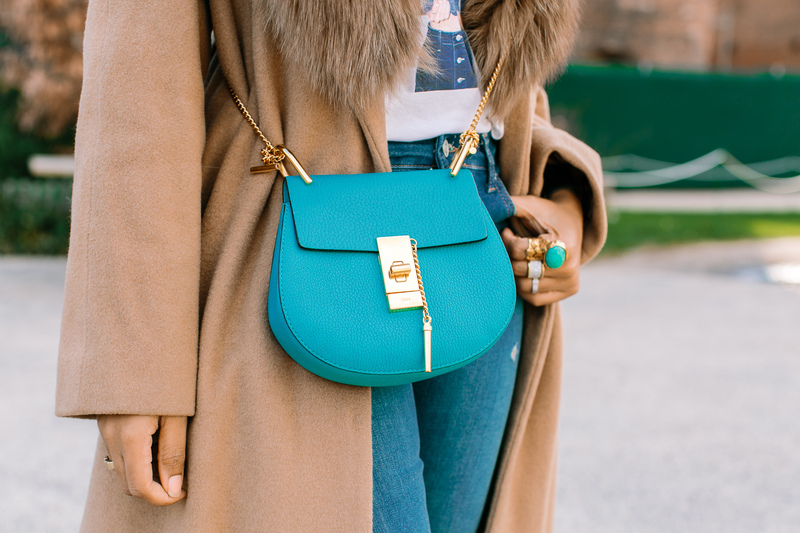 What I would have to say I love most about my Chloe drew bag is the jewelry-inspired hardware, and the textured-leather . It’s like a match made in heaven for my Saint Laurent arty turquiose ring. Not to mention on really frigid days the ability to wear as a crossbody while keeping my hands cozy and warm inside of my coat pockets is also an added plus.